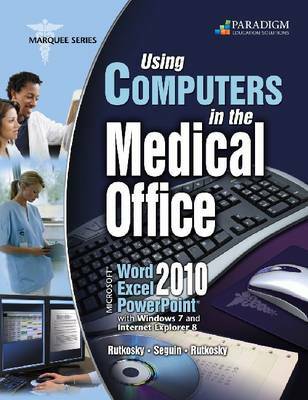 Now with coverage of Microsoft Office 2010, this new edition of Using Computers in the Medical Office teaches the essential features of Word, Excel, and PowerPoint within a medical office context. Students learn to create a range of documents such as history and physical reports, consultation letters, chart notes, job announcements, flyers, purchase orders, invoices, payroll and travel expenses worksheets, and a variety of presentations. Students experience quick success with clear step-by-step instructions for preparing realistic medical office documents; Four levels of hands-on learning address concepts and features retention, skills application, and independent problem solving; Comprehensive sections on integrating programs; Includes brief sections on Windows 7 and Internet Explorer 8.